Swamp Pink (Helonias bullata), characterized by a bright pink flower cluster that blooms in early spring, is one of the most unique and beautiful wildflowers in the Eastern United States. Swamp Pink is in the lily family, although there are no other lilies quite like it. 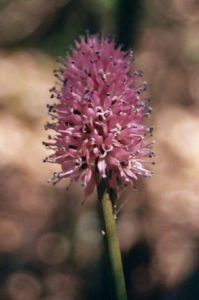 The plant’s closest relatives include a species in Japan (Heloniopsis orientalis) and the bog asphodel (Narthecium americanum), another rare plant found in New Jersey. New Jersey is considered the plant’s stronghold. An estimated 70 percent of the globally known population exists here, with Cumberland County having the largest number of known stands. For exception resources such as swamp pink a buffer of 150′ is required by the State Freshwater Wetlands Protection Act. Within the Pinelands National Preserve a buffer of 300′ is required. Because of wetland degradation and hydrological conditions these buffers may prove inadequate to sustain populations of this species. CU Maurice River hired botanist Gerry Moore to conduct surveys both to verify known stands and to discover unknown stands of Helonias bullata. His findings are contained in “A Report on Rare and Endangered Plants of the Maurice River Watershed”, February 1995. This report identifies the rare and endangered plant species and their habitats that occur in the Maurice River watershed. It also identifies existing threats to these species and makes recommendations on how these species could be better protected. Included are suggestions for future studies which could be performed that would improve our understanding of the flora within the watershed. CU Maurice River Members monitor swamp pink populations in conjunction with the US Fish and Wildlife Service to learn more CLICK HERE.